I just finished reading the passage in Luke 10:38 to 10:42 about the time when Jesus goes to Bethany, specifically to Martha's house. I say Martha's house because, somehow, it seems implied that she ran things – she was in charge. In "John Gill's Exposition of the Entire Bible", he goes into great detail and says that it is implied (perhaps elsewhere in Scripture or in extra-Biblical literature) that Martha is a widow, and that her brother and sister, Lazarus and Mary, live with her. Gill is what opened the passage up to me. He refers to Persian and Syriac versions of the story and gives a more complete picture. Martha is not just fixing the usual "stuff". She is doing something I might do. In the event that I have someone I greatly admire, or, in the case of Jesus, worship, I'd be thinking of how my home looks – every detail – how warm and welcoming to make it, etc. Right there is Martha's first problem. She is assuming that the Lord will even notice, or, in noticing, care about the pleasing decorations and touches that Martha exerts on the Lord's account. I'm thinking that Martha's emphasis is in the wrong thing. Perhaps for an important human personage – a mayor, even a regular Rabbi, what she is doing would be appreciated and even expected. But for the Lord? The Lord who came from Heaven and to whom nothing on earth is going to be impressive? Granted, the Disciples didn't understand that He was going to be killed, that He wasn't going to, at that time, bring in the Kingdom, and so be with them forever. Perhaps Martha didn't understand either, she didn't feel any urgency – after all, the Messiah is here, there's plenty of time! The other part that I think is implied here is that Martha, like a lot of women who have to share their home, may be a bit heavy handed. She likes things a certain way, and if her sister and brother have to live with her, they should help. They may have no say in how the house looks or is run, but they are expected to assist Martha because she has been "so good" as to allow them to live with her. I understand this completely. I would, I'm sure, be the same way. Frankly, I'd be very unhappy to have to share my home with another woman, and I'm sure there are lots of women out there who know what I mean – one kitchen, two women? Not so good. So Martha is going about her grand dinner a la Martha Stewart, and she's beginning to feel ticked off. 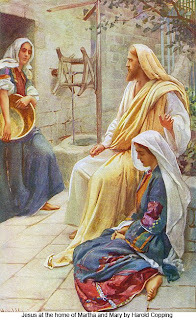 She's doing "all the work", while Mary (Lazarus, being a man, isn't expected to help with household chores) is totally ignoring everything and sitting at Jesus' feet as He teaches. First of all, to give Martha a little credit, women were not usually encouraged to have equal place with men in Scriptural learning, so Mary was bucking a very ancient trend. There were other women that supported Jesus and followed him, however, and His attitude toward women was VERY different than what had gone before in Jewish tradition. Martha finally has enough. She is waiting for Mary to understand her responsibilities and to get up of her own accord and help. That doesn't happen. So Martha comes into the room, standing, ready to leave as soon as she has her say. I doubt if she has already spoken to Mary, but maybe she has and Mary has told her that this is more important and perhaps Mary has also told Martha that all her elaborate preparations are silly. Knowing human, and especially, family dynamics, I doubt Mary is this outspoken. In any case, Martha goes directly to the Authority figure, and in true "I'm telling on you" fashion, asks Jesus to back her up and tell Mary to get off her, uh, behind – and do her duty. Poor Martha. 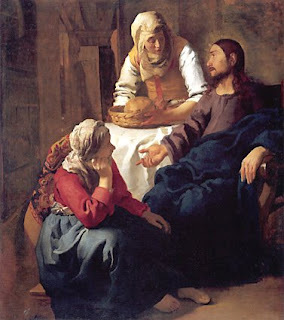 Jesus is very kind and calming to her – sees she is agitated and annoyed, self-righteously assuming that her way is the correct one – and He tells her that her mental state is unnecessary. He tells her that His word is more important than what she is doing, and that Mary has the right idea. I can just see Mary saying "YESSSS!" inwardly, or even giving into a silent "nah nah nah nah nah". I can also see Martha visibly deflating and embarrassed to have her authority denied in front of her sister – and perhaps not understanding. After all, Martha is the one who yelled at Jesus for not coming soon enough after Lazarus' illness so as to prevent his death – I have a feeling Martha is She Who Must Be Obeyed. I could probably write for days, but you all (what – all 2 of you?) would fall asleep. There is so much between-the-lines family "stuff" going on here, I just love it. Ahh, this Martha who had to redecorate her home two days before Christmas guests arrived understands completely what you are saying. Thanks for the good insight into the story. I, too, would be Martha - and I would be REALLY po'd at Mary. I think the older I get the more likely I am to take rebuke - I just know that I need to be corrected now and then - and who better than the Lord Himself. I hope Martha took it well and took it to heart. He loved her as much as He loved Mary - and perhaps He corrected Mary for something else that isn't included in the Bible. I struggle every day with making sure my priorities are right - the Lord first, Bible study and prayer - and then all the cares and jobs of the day. I don't always succeed because I see a job that needs to be done and I jump to it....unlike Mary.